Obituary – Lighty, Roy S « Perry High School Alumni Association, Inc.
Roy Lighty, 83, resident of the local area since 1908, died at 7:45 a.m. Monday at Perry Nursing home. Funeral will be at 2 p.m. Wednesday at Calvary Baptist church with Rev. W. T. Dunn, pastor, officiating. Burial will be at Grace Hill cemetery under direction of Brown Funeral home. Memorials may be made to the Calvary Baptist church. 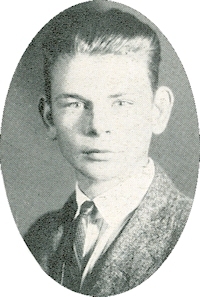 Lighty was the son of Edgar and Ida Lighty and was born at Chatsworth, Nov. 15, 1905. He attended school at Lucien and Perry and graduated from Perry high school. Lighty also attended Ponca City Business college. He and the former Lillie Lau were married on June 1, 1930. He farmed, had worked at local service stations and was a 15-year employee of Morrow Service company of Perry. He was a member of the Calvary Baptist church. In addition to Mrs. Lighty, of the home at 202 Fir avenue, survivors include two sons, Donald Lighty, Mulvane, Kan.; and Everett Lighty, Perry; two sisters, May Lau and Ruby Morrow, both of Perry; one brother, Glenn Lighty, Perry; four grandchildren and six great-grandchildren.